For some players, a largely beneficial card that gives the opponent creatures will recall memories of Hunted Horror and the other members of its cycle. The tokens generated by Dowsing Dagger are less exploitable than the Hunted creatures, mainly because they can’t attack and they’re also surprisingly ineffective at stopping any creature carrying the Dagger. Even if there isn’t something flying or unblockable to equip, the power boost is enough to make most things a reasonable threat to early-game creatures. It’s held back not so much by that but by the total of four mana required to play and equip it; Lost Vale is reminiscent of one of the most powerful lands ever printed, but it’s not the most efficient way to have that much mana by turn five or so. But it’s hard to say no to such an enormous amount of mana, and there are plenty of casual and Commander decks that can never have enough. There are creature decks that can actually make use of both sides of the card – imagine a goblin deck with Flamewave Invoker. This card is cute. I like the idea of clearing a path through the jungle until you find a secret. It’s a great take on a classic adventure trope. The Plant tokens aren’t a bad drawback at all, unless you’re up against a sacrifice deck I suppose. In multiplayer you can always help someone out by giving them some blockers and just attack another player next turn. The stats given by the dagger are decent for the cost, similar to “Dagger of the Worthy.” I’m not sure if this was intentional flavor or not, but the easiest way to discover “Lost Vale” is to fly. With Kitesail Apprentice you can deal four damage and transform the dagger on turn 3. Not much to say about Lost Vale, its simple and good. The fact that it can only generate 1 color is interesting. Three mana off a single land is huge and I would have been content if they were all colorless. 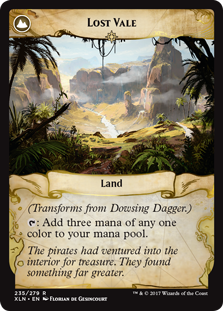 If mana fixing is what you need, I might go with Treasure Map instead.The irony of my previous paragraph is that the color that boons the most from this kind of mono-color ramp is green, the color with little to no flyers. But that’s what trample is for. White and red are the colors best with equipment, but generally don’t require a whole lot of mana, so this card feels a bit like a dud. This one is a potentially fun one. 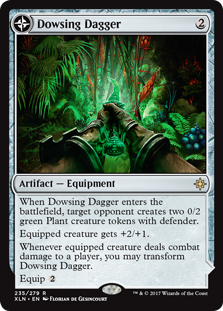 At first glance, Dowsing Dagger looks…questionable. +2/+1 is nice, but it’s a four-mana investment that also gives an opponent two blockers to throw up in front of it, and you need to get through to an opponent to get the flip trigger. That this is an equipment makes it better, though; it’s not unreasonable to stick this onto a flying or otherwise evasive creature on turn 3 or 4 and swing through. Of course, the flip trigger is optional, so if it’s better to keep the +2/+1, there’s no harm in doing so. The flipside, though, is a pretty nice incentive: it’s basically Lotus Vale, a notoriously powerful land from Weatherlight that plays really dangerously with untap effects and the like. This time, you don’t need to sacrifice lands to get it into play, and going from three mana to six mana is a massive spike. Turn four seven drops are…well, maybe a bit good, even if it takes a bit to get to that eventuality. Dowsing Dagger is a powerful card if you have a shell capable of taking advantage of it. Definitely worth a look if you have a creature deck that wouldn’t mind an extra bit of late gas.